SOAPware DocumentationSOAPware FAQ'sFAQ's SMARTextQ: How do I copy a SMARText item to create a neww one? A: Existing SMARText items can be duplicated and modified by the user. Note: It's very important not to change the fundamental meaning of duplicated items. For example, if you duplicate Tylenol, do not change the name to Amoxicillin. The coding system (in the background) for the item will still identify it as Tylenol in the computer and in the database. It is also very important to make edits to the duplicated item and not the original. 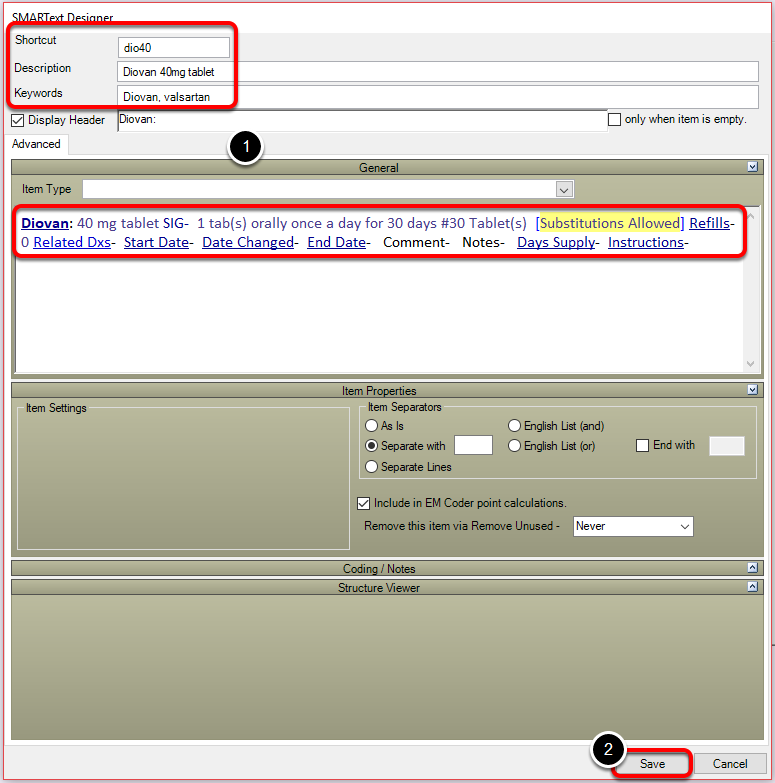 The duplicated item can be determined by checking the values in the Last Modified column in the SMARText Items Manager. Click on SMARText Items to access the SMARText Items Manager or press F10 on the keyboard. In the SMARText Items Manager, type a keyword in the Find box. Click to highlight the desired SMARText item. Right-click on the item and choose Duplicate. Now there will be two of the items in the list. The duplicated item will appear with a yellow triangle and the "Last Modified" date will display the date of the duplication. Click to highlight the duplicated item. Within the SMARText Designer, make the changes to the Shortcut, Description, Keywords and sub-items as desired. *Note: It is highly recommended that you DO NOT change the Display Header. Previous Lesson: Q: Why do some words expand into text when I don't want them to and how do I resolve this issue? Next Lesson: Q: How do I add a comment or free text to a structured item?